Gmail Snippets is built specifically to work with Gmail and G Suite email accounts. Once you’ve installed the Chrome extension, you can start using Gmail snippets while composing your emails with just one keyboard shortcut—directly from within the body of your Gmail email. There is no need to log into a separate email service or website to manage your Gmail Snippets. We’re all busy, so we understand why you need to have a snippet library to draw from. We provide you with popular snippets to use, and invite you to edit them as you see fit. 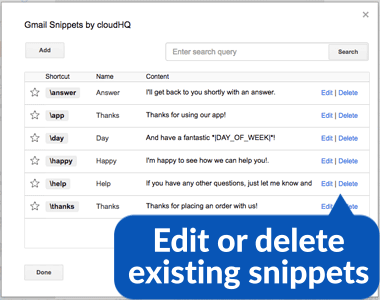 Gmail Snippets is fully editable. 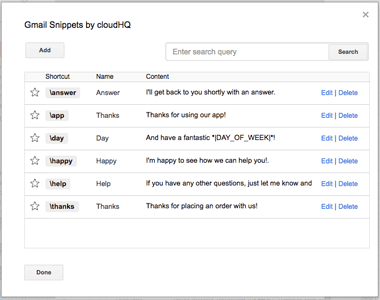 You’ll have access to click on each snippet for you to edit, or even delete from your Gmail snippet library of commands. This gives you full control of what you want to say, and how you want to say it. Need to add more snippets? No problem. Just click on the snippets icon on the top of your page and then click on “Add” in your Gmail snippet library. You can add as many snippets as you wish. In our example here, we were able to write an entire email by only typing 3 snippet commands. Imagine how much time you’ll get to save with these snippets ready to do all the repetitive work for you. We free up your time so that you can do something more productive throughout your day. Sales professionals who want to reach out to clients, without needing to rewrite the same pitch over and over again. Customer service representatives who often write clients back with a thank you note, and what timeframe their issue will be addressed by. Job seekers who wants to let hiring managers know about their outstanding achievements. Recruiters who often need to reply with a standard message to a candidate. Human resources who often want to let their employees understand that they’re empathetic to their request. Save common requests for documents, thank you snippets or your company snippet. Realtors who want to make sure their clients are reminded of all your past successes with their kind of real estate interests. Anyone who wants to save time from writing the same sentences over and over in their emails, and wants to increase their work productivity and have their boss notice how efficient they are.